Matt Kenseth is an American former professional stock car racing driver. He last competed part-time in the Monster Energy NASCAR Cup Series, driving the No. 6 Ford Fusion for Roush Fenway Racing. He had stepped away from full-time racing after the 2017 season after a career racing for Roush Fenway Racing and Joe Gibbs Racing. 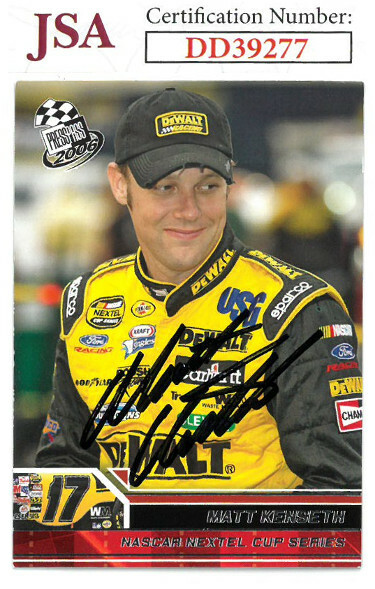 Matt Kenseth has hand signed this 2006 Press Pass Racing Trading Card #13. JSA Hologram #DD39277 and Certificate of Authenticity.